Notes: To Sleep along the River: Reddi, rust, lichen, flood-tumbled stone. Notes: A rusted metal door from a burnt out electrical parts building, and a layer of volcanic ash, from Crown of Rust, Dress of Ashes. Her crown is an image of one of the most beautiful decayed objects I have ever seen, a rusted metal door, warped and burned in a fire, exposed to the elements, and corroded. Her dress is an image of volcanic ash, layered, from a cliffside on Mount Hood. of Mt. Hood. In so far as the mind sees things in their eternal aspect, it participates in eternity. Notes: Vine maple, lichen, columnar basalt.Zhalih as Gaia. Notes Suffer the Time II: The bus had been driven to Oregon, at the end of the 60's, by two members of the San Francisco mime troupe. They bought a small plot of land outside of Portland, lived in the bus a while, built a home, raised a family. One became very active in poetry and community radio, one became a carpenter. They were Italian. Every Easter they put on a lovely feast, with two kinds of home made sausage, traditional Easter cake stuffed with Ricotta cheese, home and my other wonderful things brought by their guests. (my mom is Sicilian, so I loved this) The couple grew old. The bus stayed in the yard, rusted, became covered with plants, moss and lichen. Beautiful, it became simply beautiful. A simple piece two layers, beautiful and somber Aimee, and a century old gravestone, covered with lichen, decayed in time. Notes: Lichen, sunlight on basalt, architectural mask (Koolhaus Seattle library), Aimee. The light of nature and knowledge. Notes: A tribal mask, the texture of rusted and flaked industrial barrel. Notes: Rivets and corroded paint. The steel girders of a double-truss bridge. Notes: Architectural texture from Rem Koolhaas (Seattle Public Library) and Frank Gehry (Experience Music Project), and fractured basalt. Notes: Nature, man, life, time, growth, earth, metamorphosis, and decay. Transfigurations 36 – Portrait of a Poet in the 21st Century. I take many thousands of photos. Sometimes when I go hiking I focus exclusively on the lichen, moss, rock, rock and wood patterns, ignoring the landscape. I photograph decay, corrosion, dissolution. I photographs the facades of buildings reflecting changing lights. All these textural elements have symbolic and poetic meaning, as well as visual beauty. When I am ready, I analyze my images. 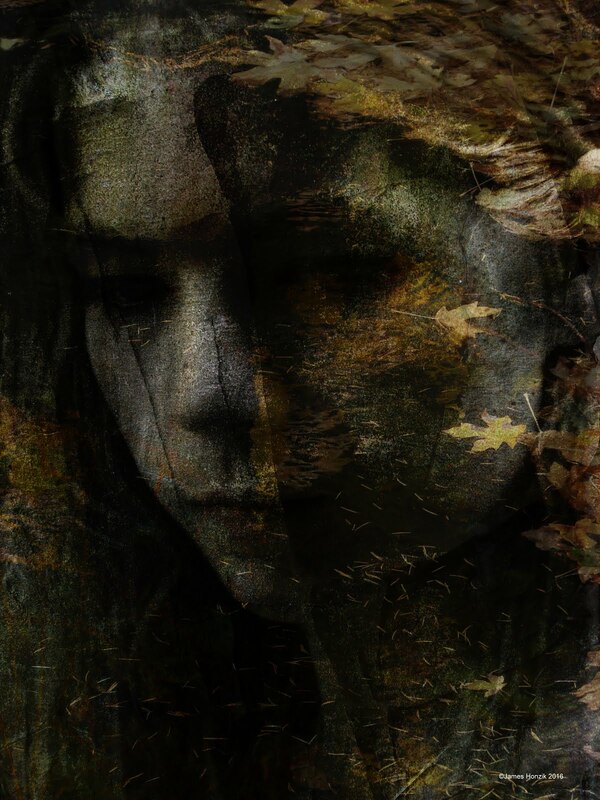 I take my best portraits, and my best textural photos, and combine them digitally. I go through hundreds of pairs of images, exploring the complex combinatorial space, following my own heuristic devices and intuitions until, as if it had dropped out of the sky, a new piece appears in front of me. I have techniques and methods, of course, and when I see something appear I might have to push it to its own fulfillment, but there is an essential part in the creation of many of these pieces that they came into existence their own being, something unexpected, something even difficult to name. They are visual poems. I graduated from the University of Wisconsin, then studied poetry under John Yau, Bernadette Meyer, and David Trinidad at the Poetry Project at St. Mark’s Church, the heart of poetry in NYC, and with Charles Bernstein at the New School. Out on the West coast I fell into a job as a commercial photographer. In a year I took over 50,000 photos of buildings in cities all over the Pacific Northwest, in rain, in fog, in sun, in shadow, in mist, in summer, and winter. Now, somehow, my poetry and photography has combined. 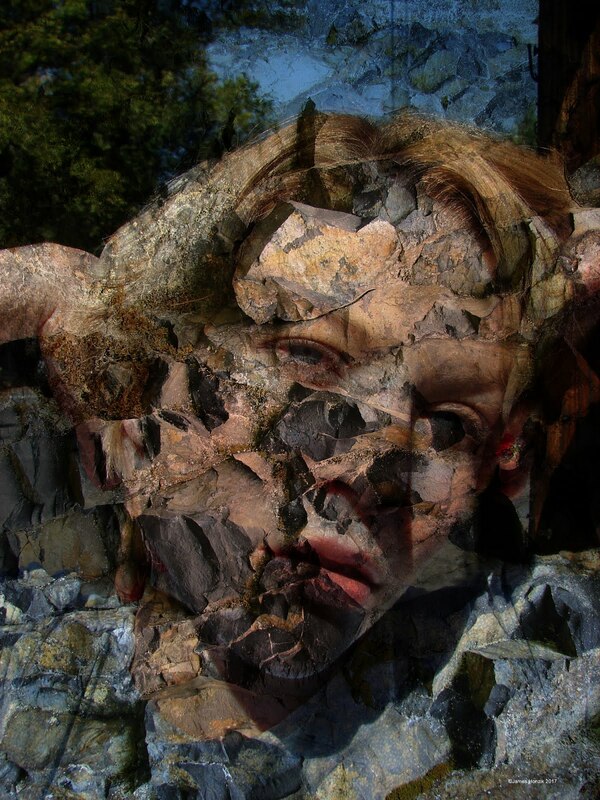 Lichen, water, stone, corrosion, decay, and the faces of my friends, have become the vocabulary of a visual poetry. Produced the documentary Salmon Poet, which was directed by Sabrina Guitart, and starring Portland poet Walt Curtis. Directed the cult favorite Portland satire, The Worriers, a parody of the lives and loves of the Portland, Oregon, poetry community. Its tagline "Bad Gangs, Bad Girls, Bad Poetry.